Alberto Nacif was born in the isthmus state of Oaxaca on Mexico’s west coast where Cuban derived rhythms were part of everyday music. He began playing conga and bongo drums at a young age with local musicians in Mexico. He emmigrated to Detroit, Michigan as a teen, and became involved in that City’s Jazz, Disco and Latin music scene, playing in multiple venues, but found the Latin Jazz muse by playing with Saxophonist and composer Jimmy Stefanson’s “La Combinacion.” Alberto initially honed his percussion skills with conga/bongo master Armando Peraza (of Santana fame). Alberto is the consummate student of Afro-Cuban drum traditions, and has traveled to Cuba since 1982 to study and perform also studied Cuban percussion with Esteban Vega Bacallao “Cha-Cha,” Jesus Alfonso, Victoriano “Titi” Espinosa, Danilo Perez, of Los Munequitos De Matanzas, Tomas “Panga” Ramos of Cubanismo, and Manuel “Anga” Diaz, of Irakere, and Jose “Pepe” Espinosa of Afrocuban All-Stars and Aguanko.. He has performed nationally and internationally with Dizzy Gillespie, John Faddis, Arturo Sandoval, Jane Bunnett, Munequitos de Matanzas, and Frank Emilio Flynn. He led the Latin Jazz group “Cubop” in the early 1990s, and co-led Tumbao Bravo for 10 years, until 2015, and has recorded with the Lunar Octet, Francisco Mora, Marcus Belgrave, Tumbao Bravo, and now with his group Aguanko. 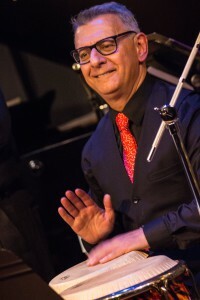 Alberto has composed over 30 Latin Jazz pieces featured with Tumbao Bravo and Aguanko, critically acclaimed by radio hosts and in print media. These CDs of original compositions that have been featured on all the major jazz public radio stations throughout the U.S. Winner of the 2005, 2007 and 2013 Detroit Music Awards for Best Jazz Recording and Best World Music Band, Tumbao Bravo with Alberto performed at all the major Michigan jazz/music festivals including Detroit, Michigan, Lansing, Birmingham, Great Lakes Folk, Blissfest, Wheatland Dance and Ann Arbor. Alberto composed the title cut to Un Systema Para Todo, Tumbao Bravo’s 2009 release which was used as a soundtrack for the USA Network TV show, Burn Notice. Alberto has been a featured speaker and performer at the library program “The Rhythms of Cuba”, which has been presented at public libraries throughout southeastern Michigan. Other music performance venues include Chicago, Illinois, Toledo, Ohio, Duncan, Oklahoma,, Windsor, Ontario (Canada) and throughout Michigan. Alberto was the originator and host of the Cuban Fantasy program on WEMU-FM for 10 years, the show continues to be popular with NPR listeners in the South East Michigan area. Alberto was also on the board of directors at University Musical Society and was instrumental in hosting many Cuban music shows including Tito Puente, Celia Cruz, Albita, El Canario, Arturo Sandoval, Afro Cuban All Stars, Jerry Gonzalez and Fort Apache, Buena Vista Social Club, Ibrahim Ferrer, Cubanismo! and Los Muñequitos de Matanzas.